Two-Sentence Summary Ryan finds himself in the middle of a murder investigation when a philanthropist with political connections is killed at an event where he was working as a member of the security team. Things get even more complicated when Ryan’s brother-in-law, who got him the extra work, becomes a suspect. Castle: Is it One Direction? You’d tell me, right? Are they in town? Esposito: No, they’re in Hong Kong. My Thoughts Sadly, non-NGN responsibilities have forced me to be brief with this week’s Castle post. So instead of a full recap, here are Five Fast Takes from “At Close Range,” and I can’t wait to talk about this episode in greater detail with all of you in the comments! 1. Castle and Esposito being One Direction fans was one of the greatest side conversations on this show in a long time. I think I’ve re-watched that one little exchange five times since last night. Nathan Fillion and Jon Huertas had great timing with their line delivery, and sometimes a silly moment like that just lands perfectly, which this one did for me. 2. I love Kevin Ryan. I don’t know if it’s the way he’s written or if it’s the earnestness Seamus Dever brings to him or if it’s some combination of the two (I’m guessing that’s it), but I find Ryan-centric episodes to be some of the show’s finest hours. My favorite thing about Ryan is how deeply he cares about doing the right thing. It makes him an easy character to root for. I also love how perfectly in-character it is for him to be burdened by guilt and a sense of failure when things go wrong on his watch. Ryan has the one-two punch of Irish-Catholic guilt working against him, and that makes his sense of devotion to doing the right thing even more believable. 4. What’s going to happen with Beckett’s career? She’s actively preparing for the captain’s exam, but there seemed to also be some foreshadowing in this episode of a political career for her. Between the politician saying she’s gotten people’s attention in a positive way and Castle talking about the world of politics needed more upstanding citizens, I felt like this episode was suggesting that Beckett could end up in politics. However, I don’t think I’d like to see her in a more political role than captain. A politician was responsible for her mother’s death, and I don’t know if I could see Beckett in that kind of world. I’d much rather see her in Gates’s footsteps, taking on the role of captain. 5. Once again, I was reminded that—for as much as I love a fun Castle case—I’d much rather watch an emotional, dramatic one. “At Close Range” was incredibly compelling because this case had real stakes for a character we care about, and Dever made me feel just how intensely this case was weighing on Ryan. That emotional connection to the case and the sense of respect for and duty to the victim are things that I sometimes find missing in the show’s lighter episodes. There have been a few episodes this season I’m already having trouble remembering, but “At Close Range” is one I know I won’t soon forget. One thing I absolutely loved seeing is how far Castle has come in this episode. In the pilot, he was, to say the least, like a child who gets excited about a toy or gets hyper when he eats candy. In this episode, he’s a lot more mature, serious, and yet he still has that child-like personality. I know a lot of people say that Beckett has grown tremendously over the past years since Castle’s entered in her life. While I agree with them, I also agree with the fact that Castle has grown since that night Beckett came to the party. He came to be the father that we know and love, and learned how to break his own set of walls by learning to love, and learning to value relationships, and the beauty and complexity of life. Since being in a relationship with Beckett, I think he has come to how to love, wear love on his sleeve, and accepting the fact that love can be dangerous at times but also learning how to walk through them without building those walls all over again, just like he tried to protect himself by pretending to be someone he actually wasn’t. That was probably the biggest highlight for me other than the obvious in which the episode was brilliantly fantastic, and how they weaved Beckett’s mini storyline with Ryan’s security storyline with such fluidity is amazing. 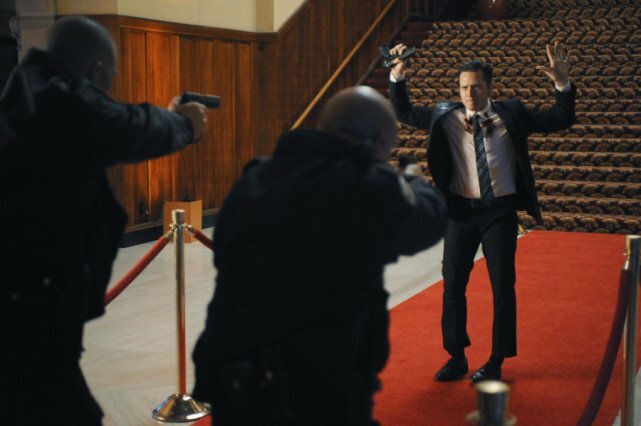 Loved seeing Seamus Dever shine as Ryan. Ryan wears his heart on his sleeve and Seamus portrays that so well. The supporting characters are so vital to Castle. Ryan is such a favorite of mine and he and Castle have a bond. The scene with them building a theory together was priceless. I do not want Beckett in politics. That would compromise her integrity just like the FBI did. She would make a good captain I believe. One of my favorite relationships is Castle/Ryan and the scene where Beckett arrives to see them with the angles set up trying to determine the bullet trajectory was my favorite in the episode. Ryan is always the most interested/open to Castle’s crazy theories and his line, “When you have a crazy theory you don’t call the voice of reason” was my favorite line in a while (although, last week’s “Where’s Wadlow” was pretty good too). Somehow I got extremely behind on Castle so I just got to this episode last night, but I was happy knowing that I had your thoughts to look forward to! I really enjoyed this episode, for a lot of the reasons you articulated here. I always prefer the more emotional, heavier episodes, but I also love that Castle always manages to bring in little moments of humor even in the darkest episodes (like Castle and Esposito’s One Direction moment). I was very glad that the show didn’t go into having Kevin be a suspect, because that’s what the promos I saw seemed to be going for and I didn’t really want to go through type of storyline with a show again. I didn’t think about it until now, but I do agree with you about the cinematography – that scene where Kevin confronts his brother-in-law was wonderfully set up to have lighting that fit the mood of the scene (and just looked really cool as well). Castle has had some really beautifully shot episodes over the course of the series. It may just be my faulty memory, but I didn’t realize that Ryan had a sister and spent part of the episode thinking that it was Jenny’s brother instead of his sister’s husband, oops ;p I do hope that his sister can come back for another episode someday though because I would love to explore more of Ryan and Espo’s families and personal lives. I agree with you about Beckett’s future career – I think that her time in DC was a good test for that type of environment because I think it would be very similar to a political one in terms of having to be able to accept some injustices in order to be able to get other things done, which Beckett clearly struggled with. I’d much rather see her become Captain and push those under her to do good work, to fight for the victims they come into contact with every day.